Your budding chef or baker will love helping mom cook up a delicious meal or treats wearing their own Personalized Any Message Kids Chef Hat, which make the perfect valentines day gifts for kids. 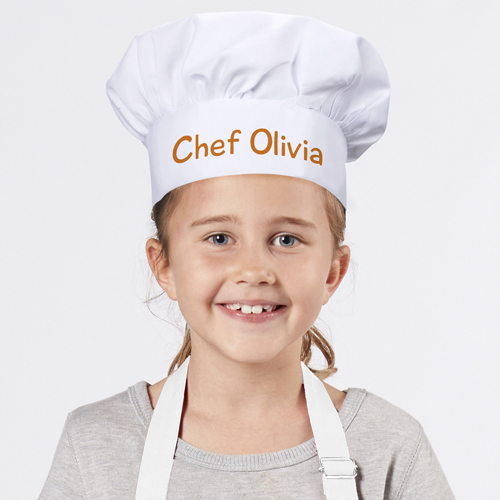 Personalized with any custom message line, in your choice of design color,, this youth chef hat is great for that special child who likes to create in the kitchen. Buy Personalized valentines day gifts for kids today! Very nice, I know my Granddaughter will love it! I just wish I would have got the writing in red , but I still like it ! Thank you ! Additional Details We have lots of aprons, shirts and chef's hats for kids in our personalized kids apparel section - take a look! And if you're looking for an apron for an adult - check out our personalized aprons, too!